This weekend I settled into my new Travel to Teach home. I am living in part of a family compound, owned by a nice Balinese man named Noman. T2T rents one part of the compound, the rest is filled with Noman’s family: son, parents, nephew, which is basically three rooms each with a bathroom and one extra “living room” with a TV and fridge. It is nothing glamorous, but it’s comfortable enough. T2T rents out one room to another Balinese guy and the other two are for volunteers. Right now I am with Marlous, from Holland, Marleen from Holland and Sandra from Germany. I feel like a slight outcast as the only non North Eastern European, but that’s the way it goes sometimes. The cultural divide between Dutch, Germans and Americans has become evident to me on this trip. Little did I think that on my journey through Asia I’d learn about Holland and German culture, but with the number of Dutch and German that travel, I have had many interactions and experiences discovering and adjusting to differing cultural norms between the two. Anyhow, I begin teaching this afternoon at an afternoon program at the Slukat Learning Center. The kids learn about organic farming, recycling and English. I am excited to be back in the classroom again, but it seems the vibe here is quite different than in the classrooms in Thailand. The volunteers do not know their students’ names (partially because the names are difficult) and I haven’t really heard much enthusiastic talk about the program, which is making me less enthusiastic, but we shall see. I am hoping for the best. I think my biggest issue at the moment is lethargy. I’m exhausted! I don’t know how people travel for so long, changing locations every night. It’s possible I picked up a little bug along the way, I have been sleeping full nights then needing a 3 hour nap in the afternoon, but I may just be zonked. Who knows. As for Bali- IT IS BEAUTIFUL! I think it is the most beautiful land I have ever seen. Lush green trees, rice patties, Hindu sculptures lining the roads. 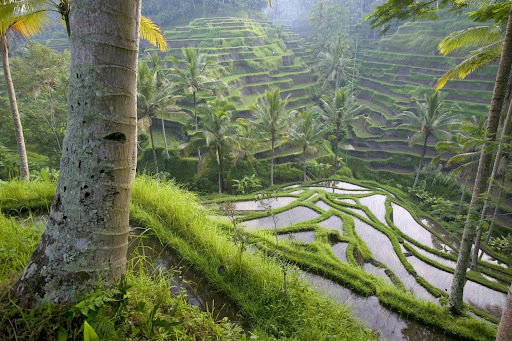 Each home has its own temple, which means there are thousands of temples in Ubud alone. People make offerings throughout the day, filling folded leaves with flowers, food and incense. They leave them everywhere, on the street, in the middle of the floor, on mantels, all to give thanks to Dewa. The form of Hinduism here is quite different than in India. It incorporates quite a bit of Buddhism and animism and focuses mainly on Shiva (the destroyer), Brahma (the creator) and Vishnu (the protector). They also focus on the five elements, believing that the body is just a temporary case for the soul. This is why the Balinese believe in cremation. They use fire to burn the body, releasing it to the air and pouring ashes in the water, thus returning the body to the elements. Speaking of which, I was able to attend a cremation ceremony on Thursday. I borrowed traditional temple clothing and was picked up at 8:30am by Alit, my driver, who took me to his home. I met his wife and mother and then we made our way over to the ceremony. There, I was able to see the body being washed/cleansed and then wrapped. They then lifted the body and people filed under, a tradition that is meant to forgive of past sins (for the living, not deceased). We then went down to the river front to collect holy water and made our way back to the temple where there was lunch and a traditional gamelan and dance concert. It sounds just like the funerals at home, right? This was one of the most foreign experiences I have had on my trip so far. There was no crying, no black, no silence. It was drumming, strumming, horns, colors, flowers, children running, smiling. If it weren’t for the dead body in front of me, I would have had a very hard time believing it was a funeral at all. The attitude towards death is so different here. It’s a time to celebrate the passing of the soul into the next phase. I only made it through the first half, after which I had to return home and sleep (for my good 3 hour nap!). I missed the procession of the body to the cemetary, the burning of the body inside a papermache cow, the throwing of the ashes into the ocean (an hour away) and then an evening party with music and rice wine. Perhaps another time. As for Ubud, it is quite Western. Lots of high end clothing stores, art stores, gelato and coffee shops. SO not what I envisioned, but about two seconds outside are serene rice fields and empty roads. It’s a good mix of familiar and foreign. Okay, it’s time for the daily nap. I will try to write more tomorrow: food, language, arts, so much to discuss! Until then. Eve – If you passed up the burning of a body inside a papermache cow, you must have come down with some kind of bug! I hope you are feeling better. We all miss you!